The oven shown is an “Aluminum Age” oven. These ovens have a conveyor of some specific design to carry a specific part through the heat chambers. LOADING and UNLOADING can be automatically by robot, pick and place, transfer from another conveyor, or by lift truck. Manual loading of some parts is also used. The conveyor load end must be long enough and appropriately accessible for whatever method is used to place parts on the conveyor to enter the oven. Unloading can also be automatic or manual. The unload end is designed to present the part to the next stage of operation. The conveying method depends on the part. A heavy duty belt conveyor can be used, or a twin chain conveyor, or a fixture chain. HEAT TRANSFER to the parts can be from the top down or bottom up with the intent of presenting heated air uniformly to the part. Some designs use air from one side to the other or both sides to the middle of the conveyed parts. The method of carrying the parts through the oven influences the heat demand to process. Since parts are usually heavy, the combined mass of the part and the conveyor must be considered in the heat calculations. The basic “Time and Temperature” profile for the part determines the number and length of zones that would be used in an age oven. FIT of the oven into the customers plant becomes a serious design consideration. Age ovens are usually very long because of the time required for the “age” process. We make sure there is enough room to accommodate the load and unload areas and meet the age, time temperature profile, in the smallest space possible. 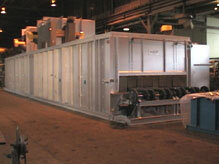 In applications where a cooler is needed to reduce the temperature of the product prior to the next processing stage, there may be a separate cooler added to the end of the oven. Age ovens are so versatile in design, they are often used for other processes in the metal industry. The user can economize on capitol equipment expenditures and floor space by using this work horse for many applications.